Chesley Fence & Deck is the premier deck builder serving Collinsville, Illinois, and all nearby areas. Having served local residents since 1967, we are one of the most experienced companies in the region, and have earned the trust of countless homeowners. In fact, we hold a long-stating A+ rating with the Better Business Bureau, speaking to our commitment to quality customer service. When you choose Chesley Fence & Deck to be your deck builder, you can rest assured that the end result of your project will exceed your expectations. We work closely with our customers to design custom decking solutions that they’ll be able to enjoy for years to come. And, all installations are performed by experienced and trained professionals, ensuring our projects are completed precisely and in a timely manner. For our wood options, we offer top-quality products to ensure a long-lasting structure. 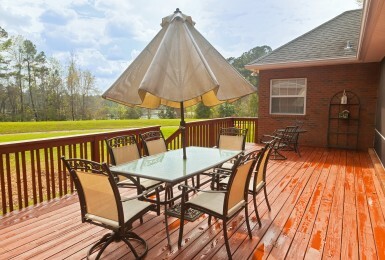 And, decks made from these materials can be stained or painted to meet your exact aesthetic preferences. However, if you’d like a truly top-of-the-line decking, our Tamko EverGrain® Envision® PVC coated composite may be for you. This decking has incredible durability that is superior to lumber as well as resistance to mold, mildew, staining. It is even backed by a 20-year warranty covering deterioration. Chesley Fence & Deck is the deck builder you can trust serving Collinsville, IL. Contact us today to learn more about our products.